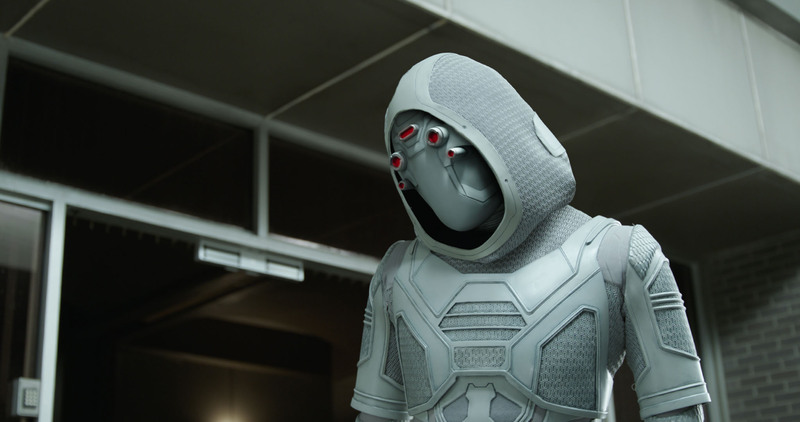 After three decades of menacing Iron Man and other Marvel heroes, Ghost is finally getting a live-action counterpart in next month's Ant-Man and the Wasp. Black Mirror and Killjoys alum Hannah John-Kamen is stepping into the role of Ghost. Because Ghost's origin has been purposefully vague in the Marvel Universe, director Peyton Reed and the film's creative team have had a free hand to re-envision the character's motivation and purpose. Marvel Studios has released a few new photos from Ant-Man and the Wasp, which may shed some additional light on Ghost. John-Kamen herself loved being able to shape a new version of an existing character, as she told Nerdist on the set of the film. "I think with any role it’s always a blank slate to carve anything, whether you’re playing a super hero, a villain, anything from any comic," she said, beaming about the freedom it allowed her. "I think it’s important as an actor to have your own input. It's been amazing! It's been fun to work with Peyton on that." As we can see from the above close-up, the mask itself is very similar to the one that Ghost wears in the comics, although its full features are unclear. For this story, Ghost's powers are tied to Pym particles, the subatomic particles that allow Ant-Man to alter his size and mass, so she may need the mask to protect herself from the negative affects on her body. In any case, her reasons for getting involved with Hank and Hope, and later Scott Lang, have much to do with the latest bit of Pym technology. "I think the more you get to know your costume the more you wear it, the more it kind of fits and molds to you, your body," John-Kamen told us. The character's physicality definitely aided her in playing the mysterious antagonist. "I love doing my own stunts," she continued. "If you just let your double do everything, you’re not there to help choreograph the movement of your character. It’s so nice to have the freedom to find the movement of the character and see what actual moves will work for that particular person." Note the green screen effects behind John-Kamen in the picture above. That scene may take place on the Quantum Realm explorer ship that will be used by Ant-Man and the Wasp as they search for Janet van Dyne, Hope's long-lost mother and the original Wasp. How and why Ghost ends up on board remains to be seen. Though we know Ghost is motivated by technology, the actress kept very mum about what that actually could mean. "No comment on that one." One thing we do know about this version of the character is that Ghost has traditionally been male in the comics, something which John-Kamen applauded. "You can look at the comics and [a lot of them] are 40 years old, and it's nice to go 'You know what? It's a modern world.' It's freeing to be able to take that character and go, yeah, that can be played by a male or female. That’s definitely forward thinking, and it's been amazing to be able to do." Such tantalizing clues! We can't wait to learn everything there is to know about Ghost, and luckily we won't have to for long. Ant-Man and the Wasp hits theaters on Friday, July 6. What do you think about the new Ant-Man and the Wasp pics? Let us know in the comment section below! Additional reporting by Scott Beggs. More from Ant-Man and the Wasp! How Civil War's airport battle set up Ant-Man and the Wasp! The incredible shrinking world of Ant-Man and the Wasp is designed to disorient you!